Handmade Jade Green Dice Ring. 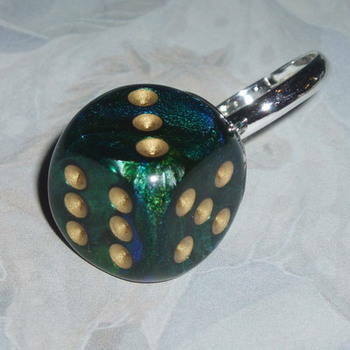 The 16mm Jade Green Chessex Dice is securely attached to an adjustable silver plated ring blank. Very funky and fun to wear. Very popular Rockabilly style just now. This ring is jade Green with blue shining through, amazing ! !